"Pappy" Powell and Petey and the car which features a number change every year. 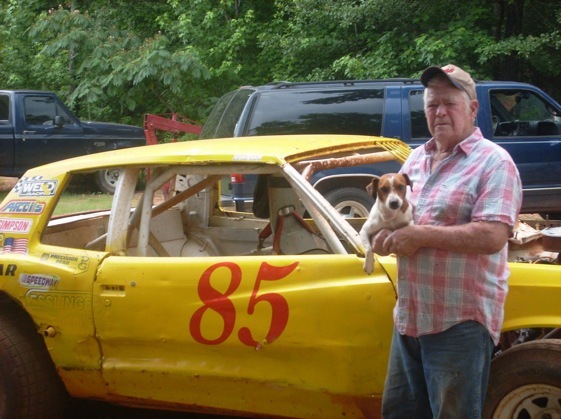 Whitesburg, Ga. – Anyone who gets a warm feeling from watching Mark Martin win Sprint Cup races at the age of 50 ought to get a real charge out of seeing Pappy Powell race his dirt track car at the ripe old age of 85. Roston “Pappy” Powell isn’t some old geezer out there making laps. As Mark Martin might say, he can “get ‘er done” with the best of the drivers in the Full Size or Street Stock class at tracks across the Southeast like West Georgia Speedway, a 3/8-mile track located in rural Carroll County, just west of metro Atlanta. Powell drives a battered 1979 Chevrolet Monte Carlo with a red “85” on the door. For the past 20 years, he has changed his car number every year to match his age. The race cars are built from parts salvaged from junkyards and cast off by his competitors. His trailer is a home-made, single-axle job that looks out of place among the fancier rigs at the track. He has no shot at “Best Appearing Car” awards. The driver shows some signs of wear too. His hair is snowy white, his hands calloused from years of hard work. His right arm is scarred and weakened from nearly being severed in a sprint car crash years ago at Devil’s Bowl Speedway in Mesquite,Texas. But looks can be deceiving. His old cars are surprisingly fast, and Pappy can more than hold his own behind the wheel. His exploits have become the stuff of legend at out-of-the-way tracks in little towns across the South. West Georgia’s promoter Sammy Duke, a former minor league pitcher who once received a 1958 Chevrolet Impala convertible as a signing bonus from the Dodgers, estimates that Powell, a retired truck driver, has won somewhere between 65 and 80 features at his track alone over the past 15 years. Duke said Powell has his own cheering section; 50 or 60 fans who sit in “Pappy’s Corner” every Saturday night. Among them are Powell’s wife Brenda, nearly 50 years his junior, and his daughter Kay. His most loyal crew member is a Jack Russell terrier, Petey, who fetches his master’s cap after each run. Duke, the veteran promoter, and Powell’s fans insist that if he had better engines and chassis, he’d win a lot more often. Powell and Duke were on good terms last Saturday night, but it isn’t always that way. Like any competitive racer, Powell sometimes hotly disputes decisions by track officials, including Duke. Powell was still somewhat steamed over a call from a few weeks back, when he was stripped of an apparent win. “I was running third when we took the white flag lap, and the guy in second place lost it in that curve,” Powell said, gesturing toward the first turn. But most of Pappy’s racing tales end with him in Victory Lane. One of his oft-repeated stories is from St. Augustine, Fla., several years back. Powell pulled his old car up to the pit entrance and received a rather rude greeting. But Powell had called the promoter ahead of time and been assured that he could race. He was persistent, especially after towing his car several hundred miles. Finally, he was allowed to start at the rear of the pack. “I blew those SOBs away in the heat race,” he said. That led to a thorough inspection of his car before the feature, but the inspectors could find nothing that violated the rules. “I started on the pole in the feature and blew them all away,” he said. Scott Dooley, who owns a machine shop in Fayetteville, Ga., and sometimes works on Powell’s engines, likes to tell the story of one of Powell’s visits to a track in Albany, Ga. It seems Powell showed up at an asphalt oval with his well-worn dirt track car. “Those boys over there were just laughing at his car,” Dooley said. But as he often does, Powell got the last laugh. He won in a runaway. They were laughing again at Childersburg, Ala., one night when Pappy’s Buick tipped the scales at a whopping 4,670 pounds. Powell’s son Joe, age 63, said that when it was all said and done, the trophy and the winner’s pay were headed back to Georgia. “He started 29th and won the race,” Joe Powell said. Over the years, Pappy has had his share of nasty crashes. He even wrecked in his first start, at the old Suicide Circle in Albany, Ga., when he was just 14 years old. Once in a race at East Alabama Motor Speedway in Phenix City, he crashed so hard the engine and transmission were thrown from his car. His son Joe, running in the same race, stopped to check on his father. Even open-heart surgery some time back didn’t stop Powell from chasing checkered flags. “The doctor told me not to even go to the mailbox, but three weeks after I got out of the hospital, I won the heat race and the feature with a pillow under my safety belt,” he said. Although he doesn’t travel as far to race as he once did, he still runs just as hard around home. Junior Hatchett, a 36-year-old competitor, said he’s been impressed by Powell’s skills. And Powell figures to keep right on kicking. Great story Rick. I love to hear those stories about the “Underdogs”.